Last week I drove to an industrial estate outside Wimbourne in Dorset to visit Britain’s only artisan copper tinner, Sherwood Tinning. I’ve always been fascinated with copper as a material, the ability to conduct heat, the warm beauty of the pink and orange glowing metal, even the verdigris patina of unpolished oxidised copper. Astrologically copper is associated with Venus: it’s the metal of beauty, an antibacterial, it does not rust and is therefore used at sea. Mixed with slaked lime, copper sulfate is a fungicide known as ‘Bordeaux Mixture’, useful for growing wine. It conducts heat and electricity par excellence. Although the Earth contains a great deal of copper, much of it cannot be extracted at present. According to the International Copper Association ‘An estimated 80% of all copper ever mined is still in use today’, a concept I find mind blowing. It’s worth a great deal as a scrap metal. One of my ex’s used to search skips for copper tanks (when everybody changed to combination boilers) which were worth about £80 each. I’ve done tests cooking with copper: a risotto cooked in a copper pan is noticeably creamier than one cooked in a good quality stainless steel saucepan. Copper is expensive. I paid £265 for a Mauviel copper sauteuse in Divertimenti. A fortune, but I use it every day so over a lifetime it’ll probably work out as 1p a use or something. Copper lasts forever. 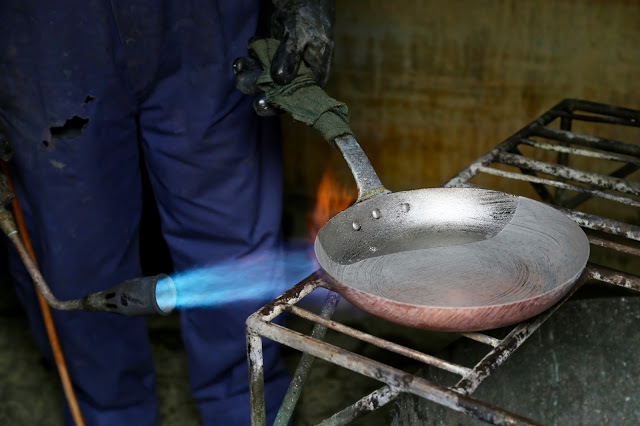 Copper pans must be lined with tin on the inside, otherwise your food becomes poisonous with an unpleasant metallic tang. You can cook on unlined copper when making jam, that is fruit with sugar. I have a large copper jamming pan, wide with sloping sides to evaporate the juices quickly, which I bought at a French ‘vide-grenier’ for 4 euros. According to this site, never put fruit on its own into copper, it will react and become dangerous. Christine Ferber, who is arguably the best jam maker in the world (I’m not even a jam fan but seriously you have to taste her preserves) always uses copper kettles to make jam. ‘I’m a Romany gypsy’, he declared before explaining that several generations of his family had worked with copper and metals, skills passed from father to son. ‘This is a very pre-historic way of crafting metal. We are the last hand-wiped tinners in the UK’. His clientele is split between private and commercial. 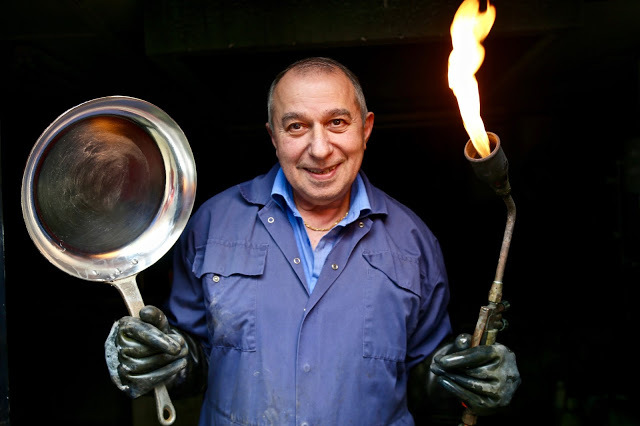 The Queen sends her copper pans to Sherwood Tinning, who are a ‘by appointment’ company, a process that necessitates at least five years service before being granted. ‘It’s not seasonal this job’ says Nick, ‘One week we are choc a bloc and can hardly cope and other times you are cleaning your work shop because you have very little to do. You never know. That’s very trusting of you. Do some people not collect their pans? It’s not like shoe menders, people not bothering to pick up their shoes. Do you like cooking with copper? No I hate it because I don’t cook. No it’s too much trouble. We use a microwave. (We laugh). I’m sorry, I shouldn’t have said that. ‘The Queen once sent me a pan dated 1737’ explained Nick ‘which is still in use’. I see photographs of Nick with the Queen on his wall. I hand him my grubby collection of five copper pans of differing sizes that I bought at a French flea market for 15 euros. It’ll cost me almost £200 to get them tinned here. Nick charges by the inch: he measures the diameter and the depth. ‘We’ve had the same prices for two years now. The flux, the tin, virtually everything we need has gone up in price. I use a company in London, G.W Neil and Sons, but they’ve been taken over by an American company. Which is a shame. They’ve put their prices up. ‘In this country we used to have a huge tin mining industry…’ I say. ‘Never got into that myself’ says Nick. 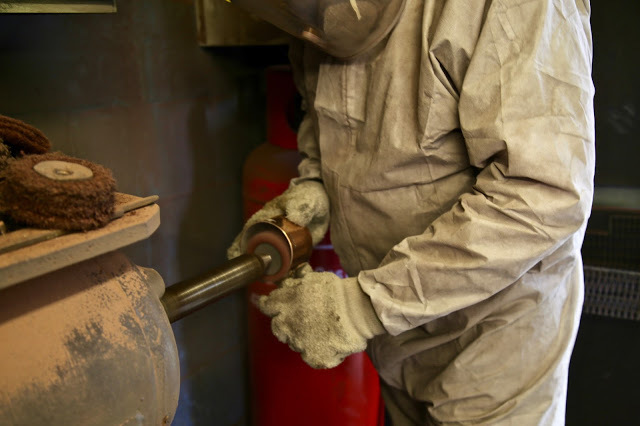 De-greasing: the copper is placed in a tank of caustic soda for up to 48 hours. Cleaning: washed in hot soapy water. Reshaping: it’s taken to the work bench where the bottom will be straightened and flattened; rivets tightened, handles strengthened, bumps knocked out. Grinding: the pans are stripped of old tin lining on a grinding wheel with wire wool. Pickling acid: the pans are left in a diluted solution of hydrochloric acid. After this the copper shines. 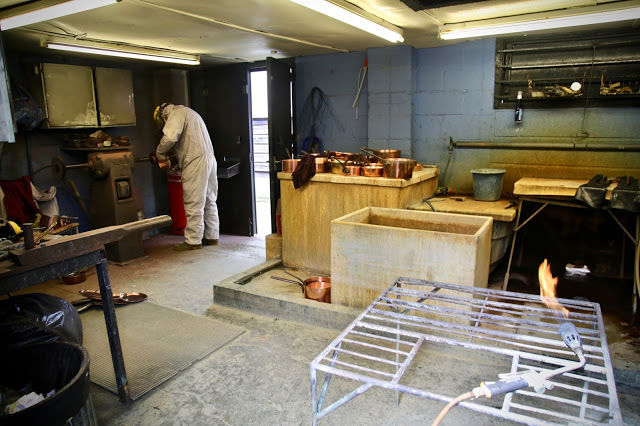 Fluxing: the insides of the pan are covered with flux to make the tin adhere to the copper. Tinning: using rods of tin and a blow torch, tin is melted into the insides of the pan. Polishing: the inside is hand-wiped, coming up bright and shiny. I can’t wait to see my flea market copper pans. Nick will even brand my initials on them. Nick recommends Mauviel copper pans as the best. Blogger David Lebowitz recently visited the Mauviel factory, read about it here. He’s also visited La Mère Poulard the famous Normandy restaurant where omelettes are cooked on a copper pan over a wood fire. Must do that. 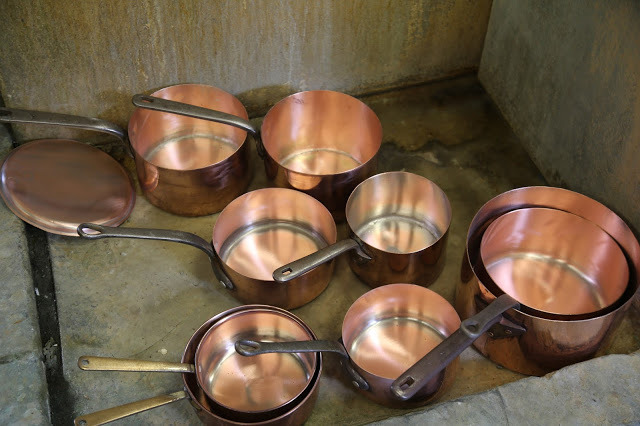 The Kitchn has a useful piece on how to clean copper. It's help to choose a great copper cookware. My favorite one is Mauviel copper pans.